This Advance Tabco PRSR-19-24 Prestige series 24" x 25" stainless steel glass rack storage cabinet is part of a complete lineup of upscale underbar equipment. 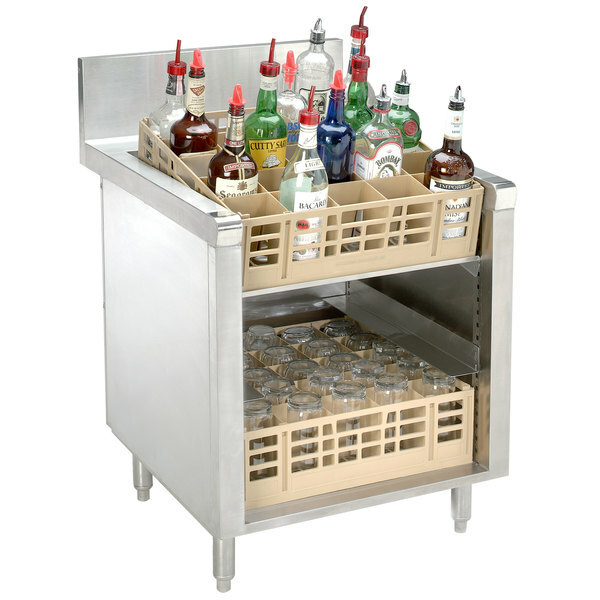 Items found within the Prestige series of underbar equipment line up perfectly with each other, creating a uniform look across any bar. In addition to a number of eye-catching features, this item boasts an extended 7" backsplash to create a truly one-of-a-kind unit. Made of durable 20 gauge, 300 series stainless steel, this unit is made for ease of sanitation and maintenance. It will hold up to 3 full size glass racks (sold separately) and has a convenient slanted top for easy access to freshly washed glassware. Inside the cabinet base, this unit features adjustable glass rack slides so that you can comfortably store glass racks of different heights and a 1" IPS drain to allow any remaining water to drain away. In addition, this unit features 1 5/8" diameter legs made of 18 gauge stainless steel to provide outstanding support. Equipped with stainless steel bullet feet, these legs can be adjusted to accommodate any unevenness in your floors.